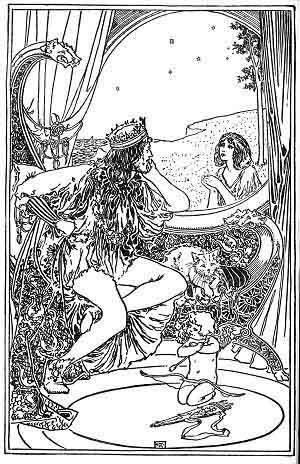 “The King and the Beggar-maid” is a Medieval romance which tells the legend of the prince Cophetua and his unorthodox love for the beggar Penelophon. As poets they did faine. But did them all disdaine. He saw a beggar all in gray. The which did cause his paine. According to tradition, Cophetua was an African king known for his lack of any natural sexual attraction to women. One day while looking out a palace window he witnesses a young beggar (Penelophon) suffering for lack of clothes. Struck by love at first sight, Cophetua decides that he will either have the beggar as his wife or commit suicide. Walking out into the street, he scatters coins for the beggars to gather and when Penelophon comes forward, he tells her that she is to be his wife. She agrees and becomes queen, and soon loses all trace of her former poverty and low class. The couple lives a “quiet life” but are much loved by their people. Eventually they die and are buried in the same tomb. “King Cophetua and the Beggar Maid,” 1884, by Edward Burne-Jones, currently hangs in the Tate Gallery, London.